A2D Designs is dedicated to helping you put the finishing touches on your projects. After all, Design is about the Details and that last 10% is just as important as the first 90%! 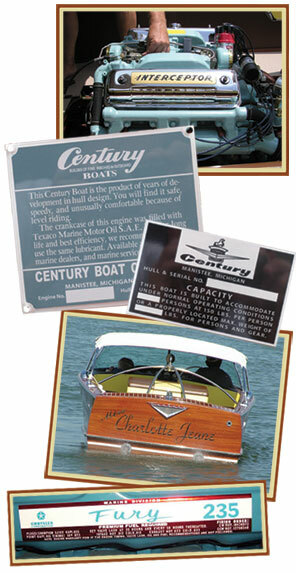 A2D reproduces accurate vintage decals, custom transom graphics, and reproduction plates. We are not limited to these services. If it's design related, it can probably be done. We are always looking for our next challenge! Whether it's for a vintage engine, antique water skis, transom graphics or any custom decal, we can do it! Old water release decals will crack over time, and even rub off or flake. Using today's technology, we print on a high quality vinyl and add a protective barrier to make a superior quality decal that looks like the original but will last a lot longer! Our Decal portfolio is constantly growing. We can recreate any decal you need from accurate dimensions and good pictures! Most original plates were typically acid etched and painted. Over the years, the chromed plates started to flake and the paint rubbed or peeled off. Our plates are produced by a sublimation process where the ink bonds with the metal proving to be very durable allowing for a quality looking product that has longevity! Future projects and endeavors depend on your needs! What finishing touches can we provide for you? It never hurts to ask! We just might be able to make it happen!